The last few years have seen spates in June, the effect of which has been to encourage the main run of sea trout to move quickly into the upper river catchment. This trend is great for conservation and helps our recently rather poor stocks of sea trout to recover by encouraging them to migrate upstream to the upper tributaries, where they should start spawning in late September. 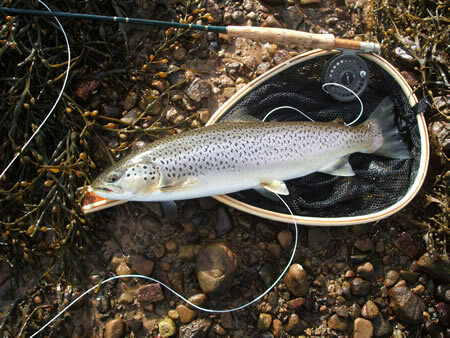 However, the trend has not been quite so good for Finavon’s sea trout catch returns, largely because the shoals of school sea trout, averaging about two and a half pounds, have not had time to settle into the traditional sea trout pools where the night fisherman can catch them. 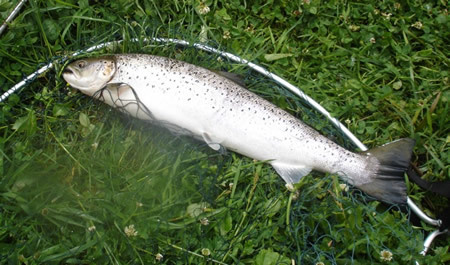 The photograph below is of a 5lbs Orkney sea trout caught (& returned) in the sea. We are regularly getting fish of this quality in the South Esk. So, spates are good for the fish, but not so good for the fisherman! My view, as the chap lucky enough to own this glorious little fishery, is that it is reassuring to see our sea trout in such good nick and, while I regret that my tenants, visitors and syndicate members aren’t getting regular night fishing sport, in the context of the wellbeing of sea trout stocks and the health of the river, these spates are a good thing. Having said all that I note that on the 24th of June the catch total for FCW stands at 40 salmon (all multi sea winter) and 33 sea trout, which is above average for the last ten years, and on par for the last 120 years! With all this high water it will have been easy for salmon and sea trout to enter the river, and many of them will have avoided that southwards rotating gyre that takes them into Lunan Bay and risk of getting enmeshed in the Usan nets. Moray and I have noted that the run of MSW salmon is fading a bit now and we are starting to think about the arrival of the grilse, the main run of which should start in the next couple of weeks. Yesterday’s total of one (9lbs) salmon and nine sea trout (up to 4.5lbs) and three salmon and a number of sea trout hooked but not landed, gave us an indication of what was going on as the spate slowly subsided and the water cleared. I have just been down to the river and seen that the level rose about nine inches overnight, but that, after all the leaching of the ground with the huge amount of recent rain, the water is reasonably clear. It is obviously a day for salmon and sea trout to head upriver. It remains to be seen if we can catch a few on the way! Don’t forget to view the FCW webcam if you want to know how fishable the river is. Optimum height when most Finavon pools fish well is when the water is bulging around the sides of the armchair boulder, and occasionally slopping over the top. It’s rule-of-thumb I know, but a very effective fishing measure! This is the illustrated story of how a new footbridge, from the Red Brae track to Jock Barefoot’s Island, came to be built. It will be no surprise to regular visitors to FCW that the bridge is to be called “Jock Barefoot’s Bridge” after a young estate worker who unwisely cut a staff from a chestnut tree close to the great keep, known today as the Castle of Finavon. Unfortunately the laird was a brutal, cruel man called Earl Beardie, an early Lindsay, who wrought vengeance against the young man by hanging him from the same tree in punishment for his ‘crime’. Legend has it that Jock’s ghost still haunts the area around the confluence of the Lemno Burn with the River. Quite recently people have seen and felt the presence of his ghost, doubtless an anguished soul after his violent fate. One of the impediments to enjoying a day’s fishing at Finavon has always been access to the north bank from the car park at the Red Brae. The lure of fishing the Red Brae pool from the north bank was often left unfulfilled because of high water making access impossible. Over the years we have had some nasty moments with fishermen struggling against the current in a rising river. Years ago Peter Reynard nearly drowned after becoming trapped in a rising river on a dark October evening. Fortunately Alasdair Petrie, the FCW ghillie, realised how serious the problem had become and made a heroic rescue of Peter in the nick of time. As a direct result of this incident we started dealing with this problem back in 1997 when we built the suspension footbridge linking the island (which we call ‘Jock Barefoot’s island’, but that is another story) with the north bank just upstream from Craigo Stream. That left the flood channel between the south bank and Jock Barefoot’s Island, and we all had to negotiate that gravel channel, which was mildly inconvenient in low water and difficult, bordering on dangerous, at higher river levels. 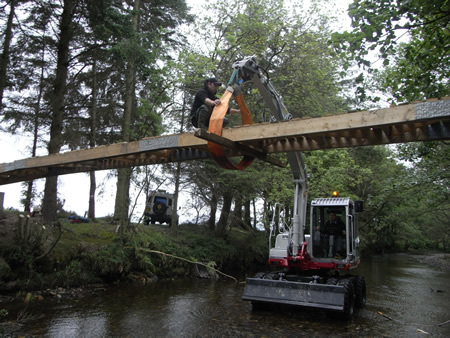 Will and Andrew assembled the bridge in the Red Brae car park. Two spruce beams made from scarf-joined timbers, strengthened with nail plates (as used for roof trusses) and then fixed under compression in an arch were then joined together with diagonal cross beams and linked with deck planks. Finally 4×4 handrails gave the structure additional strength and rigidity, all under compression. It was possible for two or three people to walk ‘across’ the bridge in its car park location withouit much sign of a ‘bend’. Will pointed out that with the braces, under compression as well, supporting the bridge in its final position, its strength would be enhanced. Two wooden supports, where the braces were to slot into the bridge beams were then removed as a final test of the strength of the bridge. On dry land it all seemed to work. OK in harbour: now for the open sea! Will adjusting the position of the beams. Getting the beams across was awkward but, once they were in position in their specially made steel brackets and joined together, the bridge was amazingly strong and could support the weight of Will and Andrew – plus a little help from the JCB with Dougie Ogilvy nursing the arched structure – strung like a spider’s web across the twenty metres of channel. Seeing it in position, looking so delicate and yet so obviously robust and strong, was a great sight, and celebrations were had at this first success! 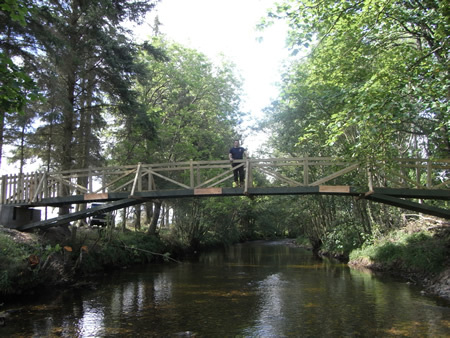 Jock Barefoot’s Bridge – and Will Wells, designer and craftsman who built it. This is the bridge across the flood channel linking Red Brae track with the island. You can now go from Milton of Finavon to Indies in your carpet slippers, not that you would want to! This bridge makes the final link for a very nice walk down the river to David’s Treehouse and further on to Indies. Huts at FCW: places for reflection & discussion, and perhaps a cat-nap. 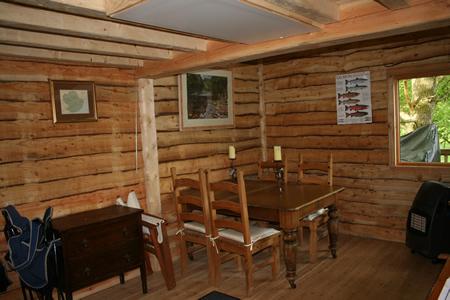 Red Brae Hut interior. The wooden cut-outs are of fish caught recently by people fishing FCW pools. The walls are posted with many interesting snippets of information about Finavon, fish & people who have fished there, and also about things completely unrelated to any of the above! Red Brae Hut in Winter 2010/11. 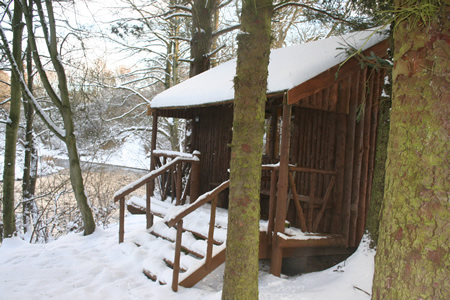 What better time to linger in the Red Brae hut than in mid winter, very often when the river is frozen and the prints of otters, red squirrels, stoats, rabbits and roe deer tell you that you are not alone! I didn’t mention minks: we don’t really want these North American intruders, because of their terrorist activities and negative impacts on our indigenous wildlife. We are trying to eradicate them. 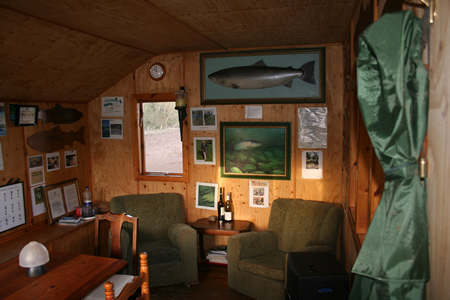 In 2010, a few months after the death of our son David, we built a Treehouse fishing hut, which of course we named ‘David’s Tree-house’ (‘DTH’ for short). He and I planned to build this ‘hut’ in a more modest way than the final version. 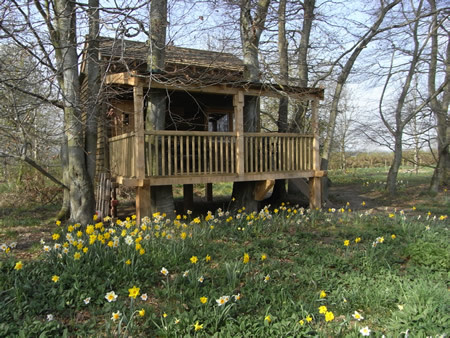 We have ended up with something a bit more special than a mere ‘hut’, largely thanks to the imagination and skills of William Wells who runs a company called ‘Scottish Oak’ (which you can google). 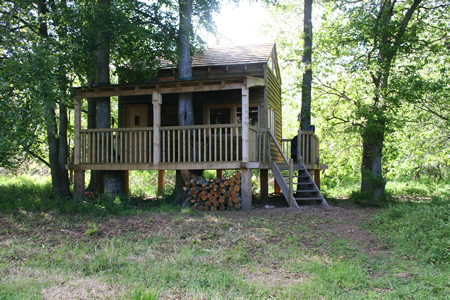 The construction of DTH was based on a mixture of treehouse and the practical requirements of a fishing hut. I think you will agree that the result is an oustanding success. My congratulations to Will and his co-worker, Andrew, for giving us what others may come to see as one of Scotland’s most attractive and original fishing huts. 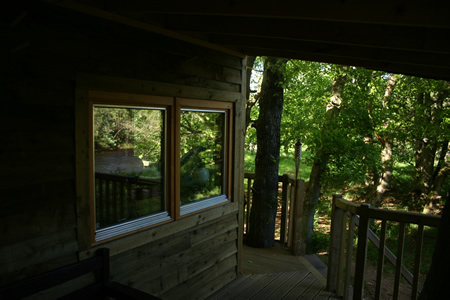 The view from inside this deliciously warm and secluded tree-house is only bettered by the view of Pheasantry Pool from the veranda. This is a very special place for fishermen and people who accompany them. David’s Tree House (DTH) on Castle Beat, the N bank of Pheasantry Pool. More of a small house with its loft and spacious downstairs, this is a place for friends to meet and discuss their catch, or prospects for fishing, or to commiserate as the case may be. We use it for family BBQs and picnics all the year round, and our visitors are most welcome to enjoy these wonderful surroundings.The wildlife here is outstanding, whether you are an amateur botanist, entomologist or just enjoy seeing reptiles, birds, flora or fauna, just being here is a positive experience, and having this as your fishing headquarters for the day (or night) is very special indeed. The fishing on Castle Beat can be good in the right conditions. The beat has six substantial pools, including the famous Red Brae. DTH is located in the middle of Castle Beat, all of which is fished from the north bank. This is the veranda of DTH looking East (downstream) to the steps. The veranda is about 6 feet above the ground with beech trees growing through the deck and the larch shingle roof. There is a bench and ample room for sitting outside during one of those rare mild Angus summer evenings. When such an evening does come along, there is no better place on earth to be, especially if conversation is interrupted from time to time by the heavy splash of a good sea trout desporting itself in Pheasantry. Incidentally, the best salmon lie in that pool is on the South side of the streamy water flowing into the pool – in the slightly slower current, which should be obvious to the practised eye of the experienced flyfisherman. View of DTH from south bank, looking across Pheasantry Pool in low water. This part of the FCW fishery used to be neglected because, especially in high water, it was quite difficult getting there. 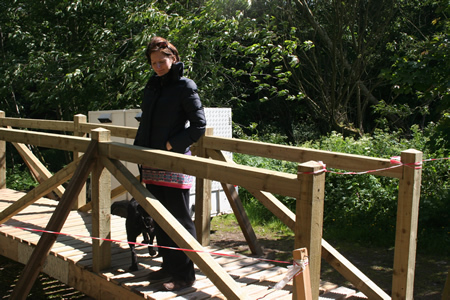 We have now resolved this problem by installing a footbridge from the S bank just upstream of the Red Brae car park. The new footbridge (about which more anon) links up with the suspension bridge at the tail of Castle Stream, and by putting in a track (OK for saloon cars) from the Haughs aqueduct along the N bank to a small car park close to DTH you can get there through the farm on the N bank of the river. 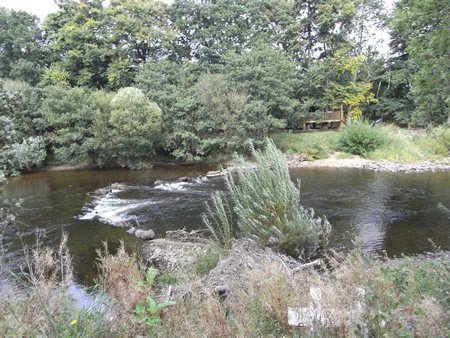 The result is that the six pools of Castle Beat are being fished more regularly, and fishermen are starting to enjoy the fishy potential of pools such as Kirkinn, Pheasantry and Nine Maidens. This is good news for the whole fishery because it spreads our catches more evenly across all four beats. In terms of a good place to be it is hard to better Castle Beat, the most private stretch of river at FCW. Posted in History | Comments Off on Huts at FCW: places for reflection & discussion, and perhaps a cat-nap.